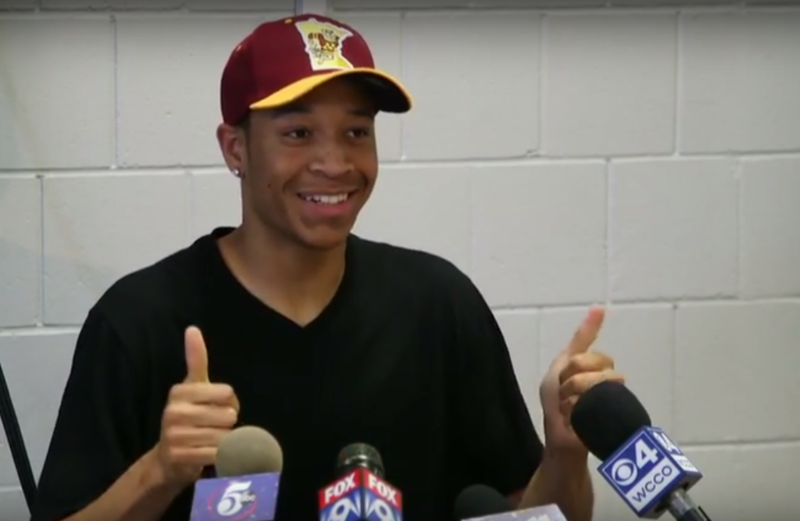 The top basketball recruit in Minnesota announced his intentions to become a Gopher in a press conference Monday afternoon. An ESPN 100 recruit and Scout’s 41st best prospect in the nation, Coffey was forced to sit out much of last season after sustaining an ACL tear. The 6-foot-7, 195 pound guard showed the skills before the injury to possibly vault him towards the position of a top-25 player. His time at Hopkins also included the 2013-14 state AAAA championship (and this buzzer-beater) while teammates with current Timberwolves player Tyus Jones. Minnesota was able to beat out several other top programs for Coffey’s service, including Wisconsin, Michigan State, Arizona, Indiana, Creighton and Texas, among others. He follows the path his father, Richard Coffey, took to an eventual stint in the NBA with the Minnesota Timberwolves. The elder Coffey played at the U of M 1986-90. He explained that he didn’t push his son toward the Gophers, but that Amir established a good relationship with the coaching staff. Coffey is considered a good shooter and ball-handler and although he has the size to play inside, he has the ability to be Pitino’s large wing that the Gophers have lacked so far in his tenure. He is also the second straight top recruit from Minnesota to stay home, starting with Jarvis Johnson last year, after a string of misses on talented players. Pitino made Coffey a priority from the “first couple of weeks” according to Coffey. Coffey’s official visit a few weeks ago sealed the deal. The Gophers have one more scholarship for next season after commitments from Coffey and Rochester’s Michael Hurt. The Gophers hope to fill that spot with Arkansas forward Eric Curry.